QE3201 1m HDMI-HDMI with High Speed Ethernet & 24K Gold Plated Connectors. HDMI Reference interconnect incorporates a new passive band pass filter to provide outstanding digital signal integrity for exceptional pictures and sound. It is recommended for direct digital connections between the highest quality, suitably equipped components, including 'Deep Colour' products. Also known as QE-3201,QE. The quality of your HDMI cable is essential to maximising the picture quality you are getting. With newer and better televisions and sound systems being released the need for a QED High-Speed cable has never been higher. Data is transferred across the HDMI cable to your television or sound system and then plays from your device. The quality of sound and picture will be limited if your HDMI cable is not of a good quality. Cheaper cables cause errors and “jitter” in the picture or sound which is being transferred. QED cables reduce this “jitter” making a noticeable difference to your picture quality. The QED Reference HDMI Cable has ultra low jitter. 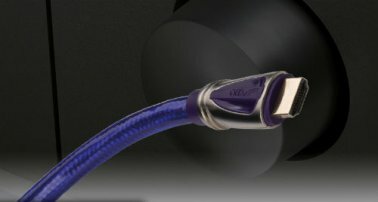 Make sure you get your QED High-Speed HDMI cable with your new Television or sound system! This High Definition Multimedia Interface connects your DVD, Blu-ray, HD-DVD, HDTV Box, or compatible Games Console to your AV Amplifier, Plasma, LCD TV, Projector or TV.